My memories of Dorothy as a grandmother are happy ones, possibly because we always lived far away and our personal contact was once or twice a year at most. I never really knew what her relationship with Harry Bird was, always being told as a child that he was her second husband, her first a William Wallace (allegedly my mother's father who was killed in the first world war). As for 'Aunty' Gertie we had no idea who she was, except that she was related in some way to the family and her children were Thora, Lilian and Norman, I could never understand how everyone fitted in to the family jigsaw, except that everyone looked and sounded so alike and appeared to have all lived together as children as one big happy family. Gertie was known as 'other mum' by my mother. All questions and enquiries were firmly avoided or brushed aside right up until my mother's death in 1996. It was only then I discovered the Mazasitisz name on her birth certificate when registering her death and by then it was too late to ask any questions. Dorothy never spoke to me about her past or childhood and I was aghast when I discovered that she was born in London as we were always led to believe that the whole family came from Devon. Alastair (my brother) and I were born in Grantham Lincs during the war. My father being posted there as a Pharmacist by the government. Dorothy and Pop Bird came to visit us regularly in their large black car and also spent holidays with us at Butlins either at Clacton or Skegness. 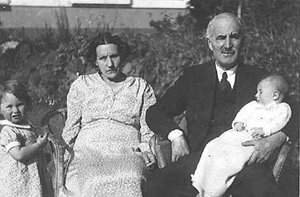 Until Alastair became ill around 1948 we also visited them as a family in Devon. I can remember big houses especially Esdaile and I think some of my cousins were born there. In later years I was sent down by train in the summer holidays to stay at Widecombe and Mansands with my cousins, Dorothy never came to Mansands with us as she was working. It was while we were at Butlins in 1950 waiting for Pop and Dorothy to join us that a message came over the Tannoy to tell us he had died. Mother was very upset. I would have been eight at the time. Dorothy never figured much in our day to day lives when I went down on holiday. She was often in bed lying in a darkened room eating grapes, working in the shops, or away at Champneys. Joy seemed to run the household and look after all the children and ferry us around in the jeep. There always seemed to be businesses to run and of course Maidencombe House Hotel which kept my uncles very busy. I remember Dorothy having a wool shop at some point and my cousins and I went to visit her whilst she was serving in the shop. I don't think she had it for long as after a short while the Bakery in Kingskerswell was purchased and I was told that Norman had taken over Little Meadow, she always spoke very fondly of him and I don't think I ever visited the house again after he took over. The Bakery was a very busy business and I remember my cousins had an upstairs attic room, later it was all converted and modernised and a café was established on the side. Grandmother used to serve in the shop and let me choose my favourite cakes, the ones I liked most were covered with green marzipan. The business was famous for its wholemeal and speciality breads which were delivered all round the district. Dorothy was a vegetarian and most of the family were brought up that way although my brother and I weren't as children. After I left home and moved abroad Dorothy and I wrote to each other very frequently exchanging news and photos. She was very happy when I produced her first great grandchild. Every winter she would write to tell me she was going to stay at Maidencombe for a week or so, this seemed to please her. In later years before she died personal contact was sparse although we continued to write letters and postcards, relationships between my mother and her became strained. Over all those years Dorothy never spoke to me about her childhood or upbringing which always remained a mystery to me. Unfortunately I never kept any of the correspondence but have some of the photographs she sent me. On 8th September 1962 I went with Janice on the train to Devon for a week to stay with Granma at the Bakery. Auntie Joy was very busy and her husband Charles got up at 4 o'clock every morning to bake the bread, Simon helped him but always came later, there was a van which delivered all the fancy bread to health food shops around the district. Granma served in the shop for a few hours but sat around a lot in the upstairs sitting room or laid on the bed. We spent some time with our cousins Adrian and Elliott. I can't remember Pop Bird although after the war we used to visit him at Widecombe - Granma talked about him a lot after he died, mum always told me he was Granma's second husband. I was shocked when Janice told me in 2002 that there never was a first husband and they weren't married. I had no idea who Auntie Gertie was and it was never explained to me - I was upset about this. Mum always blamed the family after she retired and was in poor health of forcing her to be a Vegetarian - ruining her life. We used to go down to Devon every Easter for years after Janice left home. We always stayed in Hotels as no-one could put us up. We tried to see most of the family as no one ever came to Kent to see us, Only Norman and Auntie Gertie when I was small. By 1977 mum and dad were just about retiring age so they thought it would be nice to buy a house in Devon to be near the family. We started looking in the hot summer of 1976 and took Andrew with us house hunting. We bought a brand new house in Churston which was being built. It was ready in 1977 and we went down nearly every other weekend and for Easter and Christmas. We called on Norman in his bungalow but he was ill with heart disease, we also visited Lillian & Maurice so that Mum could play her music on Maurice's instruments, he used to play the drums. After a while it became obvious that we were not welcome. Granma was getting old and Auntie Joy was occupied the whole time taking Lisa to dancing lessons and running the Bakery. We invited the whole family to the house on Boxing Day afternoon in 1978, the following year we sold up and moved back to Kent realising that it was not such a good idea after all. Dad said after that experience he would stay at the pharmacy until they carried him out in a box! Janice had to force mother to go to Granma's funeral in 1983 by driving her down to Devon from London, Maurice and Lillian put them up which was a very bad experience as Lillian was becoming poorly and Maurice was a strict vegetarian, they had to make tea from bottled mineral water. I feel very pleased now that I never married and had children and that all my relations do not live anywhere near me and I like it very much having my isolated spot, when I think back at how mother was so bitter about the way the family treated her until the day she died although she would never explain to me what the problem was. These were almost the last words she said when she was dying in the nursing home. I had not realised until now that others in the family were more favoured, if that is the word, and that another life was proceeding in Widecombe with all the family involved except Thora's and Lillian's.. Sad really, but not sad for me . It is clear to me now that although we spent most of our waking hours on the moors, we never went to Little Meadow - until it was owned by Norman. Maurice Childs was quite explicit about "that woman" Dorothy, I would guess about Harry too, but he was dead when I was six, so I never really heard about him or thought about him at all. It must have been rather traumatic for Lillian and Thora to lose touch. I absolutely knew that Maurice had no time for Dorothy and I presumed Harry too. We were living with the debris of Gertrude and two discarded daughters. Though perhaps Dudley/Maurice had something to do with the estrangemant there - who knows. These things register with kids and we had little love for Dorothy too. Maurice almost never went to the Bakery and hence we hardly saw our aunt and cousins, I remember just once or twice spending time with them when we were in our teens. We'd play the piano and horse around in the cafe but it never went anywhere after a couple of sessions. We seem to have seen quite a few photos of Gertrude in different situations surrounded by the family but never seen Dorothy in a family photo - in fact we've never seen Dorothy in a photo at all! Warren and I never really knew who Florence was!! Nothing of Dorothy's was of any great value when she died. I think the tales of great wealth were much over-rated. No one really knew who their birth mother was. Gertrude brought up all the children, Dorothy gave birth to most of them, she had nothing whatsoever to do with their upbringing, hadn't got a clue, also with the grandchildren. She was far more interested in working and being in business. The youngest daughters thought Gertrude was their mother untill the age of about 12. One day when they were at Mansands with Gertrude, Dorothy visited them with Harry she announced she was their mother, she didn't even know them. It was a great shock to them. This secret had been kept from them since birth. One memory is when later Harry and Dorothy were running a busy Guest House in Preston. Dorothy became ill and couldn't work, Harry summoned Gertrude to help look after the business and put his eldest daughter in charge of the lot of them (she was about 17) until Gertrude could return. Members of the family were certain Dorothy had left a Will but on her death it does not seem to have been found, an official search in 2003 by a family member also could not trace anything. When she was left behind in Devon she tried living with her two sons but it didn't work out, they never would stand for any nonsense and if she felt like staying in bed all day they immediately called the doctor which she did not like. She then went to live with Iris and John, this didn't work out either, Iris said she couldn't cope and the doctor arranged for Dorothy to go into a home. She spent some weeks in various care homes in Torquay. The money there was, was left to all the grandchildren. All her effects and personal possessions went to one daughter except her bedroom suite which was at Iris's and is still there today. She then became very frail and was admitted to Newton Abbot Geriatric hospital where she died. We have no idea which name Dorothy used from her first meeting with Harry Bird, from 1914 to 1919 she was Mrs Wallace. She appears to have become 'Mrs Bird' around 1921, some of her children changing their names possibly by Deed Poll or 'being known as'.